The gunmaker didn't do much wrong this year, but this one piece of puzzle was out of place. 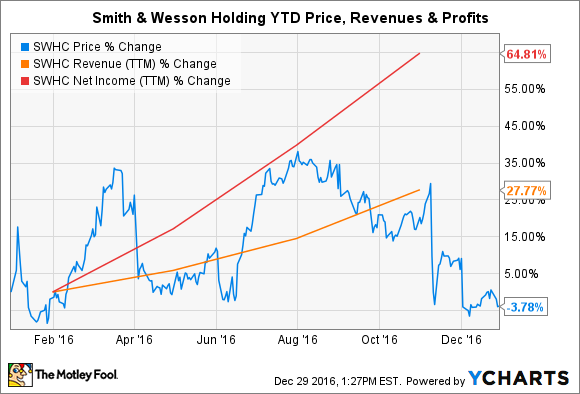 You wouldn't know it by looking at Smith & Wesson Holding's (NASDAQ:AOBC) stock price chart, but 2016 has been an exceptionally good year for the gunmaker's business. Mostly because of burgeoning gun sales, revenues soared 68% over 2015, but the transformation into a diversified rugged outdoors company, as reflected by its changing its name to American Outdoor Brands, has helped, as well. While firearms sales recorded greater growth than did the outdoors and accessories segment, the latter carried better gross margins. Stripping out one-time expenses related to the acquisitions this year of Crimson Trace, Taylor Brands, and Ultimate Survival Technologies, the segment has margins of nearly 50% compared to around 42% in firearms. So it's not so simple to say one segment was worse than the other, particularly when the rugged outdoors market could become the major growth driver in the future for Smith & Wesson. Still, drilling down further into the company, we do find one business that has stumbled along all year long: Thompson/Center Arms. Acquired in 2007 for $102 million, Thompson/Center Arms was Smith & Wesson's introduction into the long-guns market. It was a leading name in hunting with its black-powder guns, and was especially proficient in manufacturing long-gun barrels. Smith & Wesson has since expanded its business into multiple segments of the long-gun market, such as introducing its own brand of modern sporting rifles, so it should be positioned to capture changing consumer preference for these types of firearms. The gunmaker reported shipments of long guns more than doubled last quarter, far outstripping the 40% gains made in handgun shipments. Yet Thompson continues to struggle today. It was split up in the fiscal fourth quarter so that firearms like its Compass bolt-action rifle will still be found in the firearms segment, but the accessories business was transferred, appropriately enough, to the accessories segment. While that sort of common-sense division should have been intuitively simple, the integration has been hard. In an attempt to increase profitability, Smith & Wesson raised prices on many Thompson accessories and eliminated its discounting and promotional programs. That caused sales to suffer, but it helped profit levels improve markedly with gross margins rising 5 percentage points, to 47.3% in the fiscal first quarter. But that was about as good as things got. CEO James Debney admitted on Smith & Wesson's second-quarter earnings call with analysts that the Thompson transition is still a work in progress and they're trying to get the balance right between price and the SKUs they have remaining following the rationalization of a number of them. Even in areas where Thompson has done well, such as the Compass rifle, it still has problems. Shortly after it was released, Smith & Wesson was forced to initiate a recall of the weapon because it could accidentally discharge if the gun was dropped. It told owners to immediately stop using the rifle until the defect could be repaired. Smith & Wesson is no longer just a firearms manufacturer in the way that industry peer Sturm, Ruger remains a pure play on guns. Smith & Wesson has decided the rugged outdoors market is where it can achieve the greatest growth in the future, and 2016 marked the year where it began to transform itself to reflect that change. It estimates the rugged outdoors gear and accessories market is a $60-billion market, significantly larger than firearms, which is now reverting to the mean, and entering a period of "normalization." While Smith & Wesson ought to be able to take more market share from its rivals in such an environment, it's looking beyond just guns for greater growth. Yet Thompson accessories likely will hold that segment back for at least another quarter, and possibly longer.